Check out the doofus at the beginning; did he get any name right? Leon, Tornato... har har! I feared that he would've been caught up in the 'Diversity' row....because I thought that the oscar panel would've got a bit put off in awarding a film with 65 'N' words. 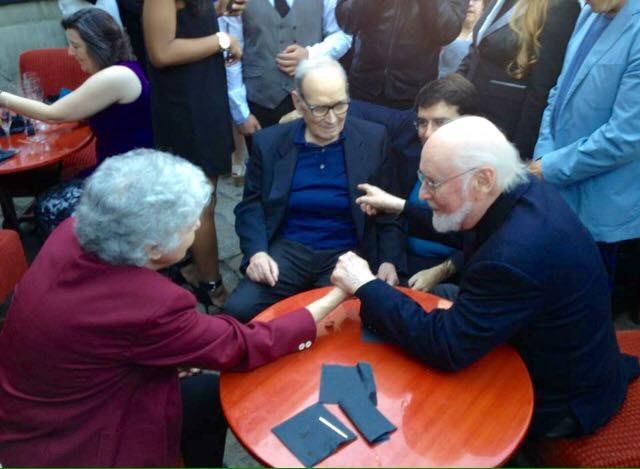 I like to - and want to - believe that even John Williams was happy for Morricone to win; had Williams won a 6th time, would've just demonstrated the bias of the Academy, and honoring Ennio actually makes William's achievements even better, as more of true achievement. Maybe I'm thinking that if I had won 5 times, that I'd want the most prolific and world-honored film score composer honored at this high level. Quentin Tarrantino should thrilled that he facilitated getting Ennio this recognition by choosing/pestering him to do The Hateful Eight. As GBU is Quentin's favorite film (other than his own), he has realized for decades that GBU is the ultimate integration of music and film, so many different original tracks in GBU, so much more than the title theme and Ecstasy of Gold. Gratulations to Ennio! That made me very happy.